Lincoln Chafee campaign plan: Attack Hillary Clinton on her 2002 Iraq war vote. Then-Gov. Lincoln Chafee gestures after signing the Marriage Equality Act into law at the Rhode Island state house on May 2, 2013. Hillary Clinton is already facing two challenges from her left. Starting Wednesday, the overwhelming favorite for the Democratic nomination will be confronted by one from her past. Chafee was one of only 23 senators to vote against giving George W. Bush the green light to invade Iraq, and the only Republican to do so. Bernie Sanders also cast one of those No votes, but the self-styled socialist has so far avoided directly attacking Clinton over that issue, or any other. (Sanders claims to have never run a negative attack ad in his entire political career.) Meanwhile, Martin O’Malley has taken several somewhat subtle shots at Hillary over her past positions on immigration and marriage equality, but has largely kept the gloves on. Even if he wanted to hit her on the issue of Iraq, the former governor of Maryland lacks his own Senate vote to contrast with Clinton’s to help those punches land. 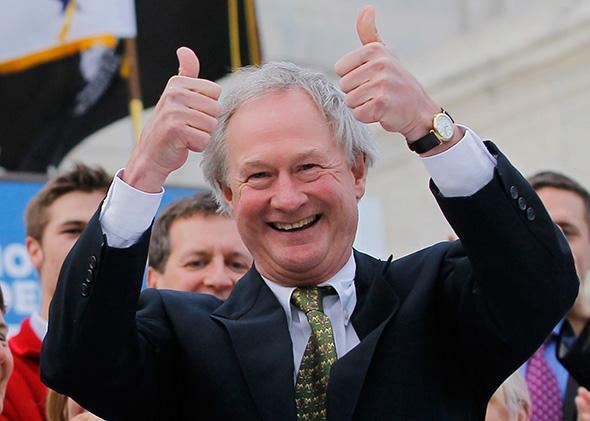 By focusing on Iraq, Chafee has smartly carved out an issue for himself. Now the question is: Do liberals still care? The Iraq war—and Clinton’s authorization vote—was a defining issue of the 2008 Democratic primary, which Clinton lost to a vocal opponent of the war, Barack Obama. No one is going to mistake 2015 Chafee with 2007 Obama—particularly given Chafee’s somewhat puzzling lack of a campaign infrastructure—but Clinton would no doubt prefer to avoid another trip down memory lane, particularly as she tries to woo skeptical progressives. According to a YouGov poll conducted in April, 57 percent of self-identified Democrats said that a candidate’s support for the Iraq war in 2003 was “mostly” or “totally unacceptable” today. * How serious they are are about that view is undercut by Clinton’s continued polling dominance, but Chafee’s presence on the campaign trail, cable news, and the debate stage will make things awkward for Clinton and her supporters. If Chafee’s attacks generate some enthusiasm, O’Malley could also potentially pile on. Chafee’s entry into the race also offers a much-needed counterweight to the current political conversation among Republican hopefuls, most of whom have been arguing over the semantics about just what type of mistake the 2003 Iraq war was, not over whether it was started in good faith. The GOP’s preferred knowing-what-we-do-now hypothetical takes as a given that there was no reason to doubt George W. Bush’s WMD-themed justification for the war, or to oppose the invasion on larger grounds. Chafee, like Obama before him, makes it clear there was indeed a choice. Clinton was slow to admit she erred in voting to authorize the invasion, but she finally did so in her 2014 memoir, Hard Choices. “I thought I had acted in good faith and made the best decision I could with the information I had,” she wrote. “And I wasn’t alone in getting it wrong. But I still got it wrong. Plain and simple.” The directness of that admission was admirable, but admitting you got something wrong will seem much less laudable if she’s forced to say it on a debate stage while flanked by two candidates who can say they got it right. Why Can’t Republicans Call the Iraq War a Mistake? *Correction, June 3, 2015: This post originally misstated that the YouGov survey was conducted in May. It was conducted in April.